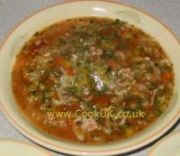 This authentic Irish Stew recipe doesn't take much preparation time but it makes a really tasty meal. The amounts of meat and veg can be varied to suit your taste. Wash the courgettes, slice off the top and bottom tips then cut the courgettes into slices, roughly 1 cm / ½in thick. Peel the potatoes then cut them into small cubes (roughly 1cm / ½in). Peel the onion the slice it. Peel and finely chop or crush the garlic. Finely chop the chives and parsley. We have prepared it here in the 'authentic' way using lamb chops but we also prepared it later with chunks of lamb loin which made a very good Irish Stew. Beef is another alternative to lamb with excellent results. The vegetables used are traditionally onion, potato and carrots but almost any winter vegetable can be used as well. We used lamb chops (rack end chops to be specific). The good thing about chops is that they have some bone on them which enhances the flavour of the Irish Stew as it cooks. However, chopped up lamb is a very good alternative. 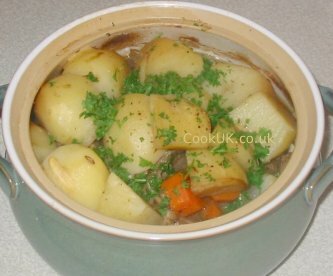 For this Irish Stew recipe you will need an oven proof dish with a lid - a plate over the top of the dish will do fine. Trim some of the fat from from each of the chops and put the fat in a medium heated frying pan. This will melt some of the lamb fat for use in the next couple of steps. Set the oven on at 180C / 350F / Gas Mark 4. Chop up the onions into rough chunks. Peel the potatoes and cut each into 4 parts. Scrape the carrots then cut into larger than normal chunks. 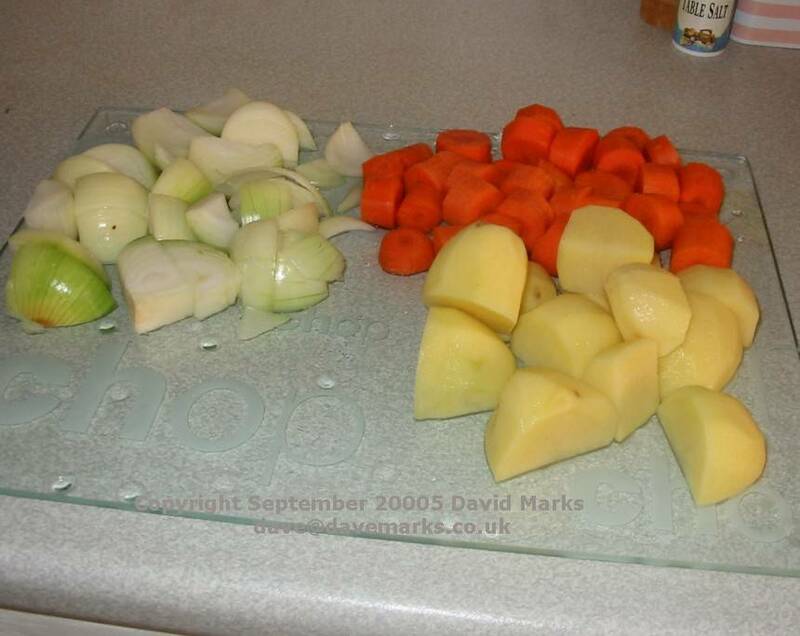 Click on the picture to enlarge it for an idea of how big to chop the vegetables. 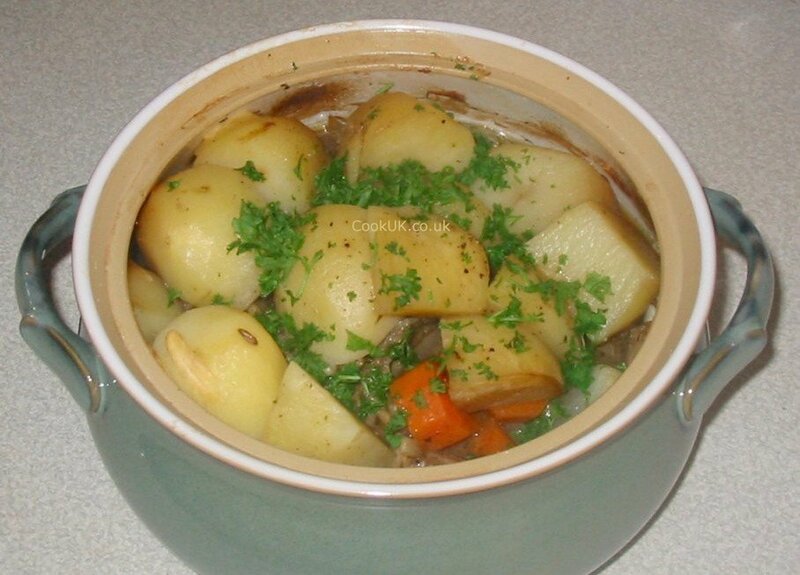 Irish Stew is a rustic menu and part of its charm is that the ingredients are kept in large chunks. Saves on preparation time as well! 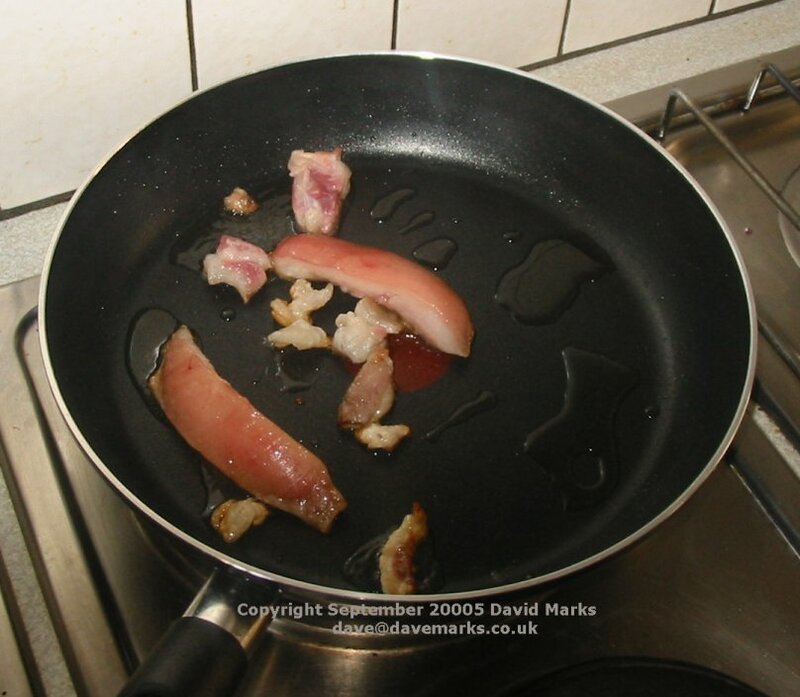 After 5 to 10 minutes, remove the fatty pieces from the frying pan and throw them away. 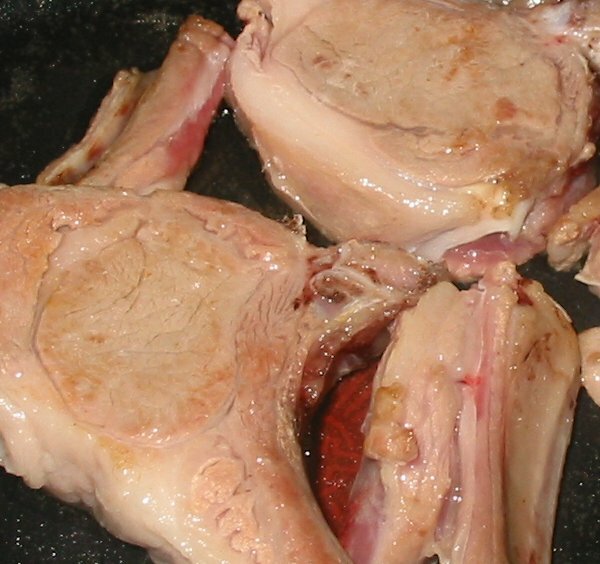 Fry each lamb chop in the fat for about three minutes at a medium temperature - turn half way through. Enlarge the picture on the left for an idea of how browned the lamb chops should be. Put the lamb chops in the casserole dish and fry the carrots and onions in the remaining fat for two minutes - turn frequently. Put the onions and carrots over the lamb chops in the casserole dish. Season with salt and pepper. Add the Worcestershire Sauce (Lea & Perrins), the pearl barley and the lamb stock. Finally add the potatoes on top, don't mix them in with the other ingredients. The aim is to let them be steam cooked over the other ingredients. Add some more salt and pepper to season the potatoes. Put the casserole (covered) in the pre-heated oven and cook for 1 hour. 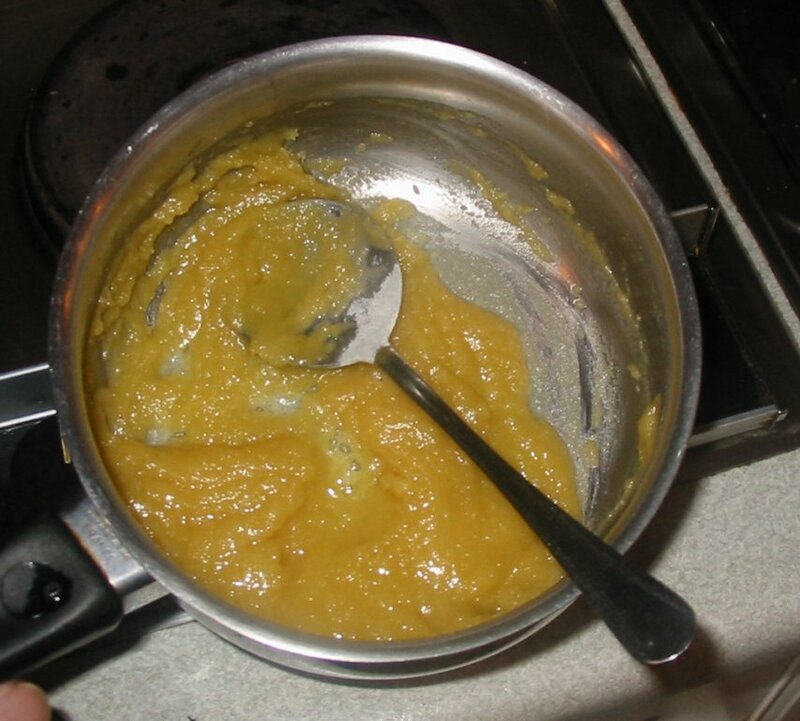 Roux is a mix of 50 / 50 butter and flour which will thicken the gravy in the casserole dish. It can be used to thicken all sorts of sauces as well. Melt the butter on a medium heat in a pan, then whisk (or vigorously fork in) the flour. Cook for 2 minutes whisking all the time to prevent it sticking to the bottom of the pan. Take the casserole dish from the oven and pour off most of the gravy into the pan of roux (be careful, the casserole dish will be hot). Mix in the thyme. Quickly blend the gravy and roux together with your whisk or fork. Add the thickened gravy back into the casserole and scatter the top with the parsley. Check the seasoning and add salt and pepper if necessary. Put the casserole dish (covered) back in the oven for ten minutes. Serve onto hot plates. No other vegetables are needed, they are all cooked and ready in the one casserole dish! Any red wine will go well with Irish Stew, but a glass of Guinness is probably the best accompaniment of all! 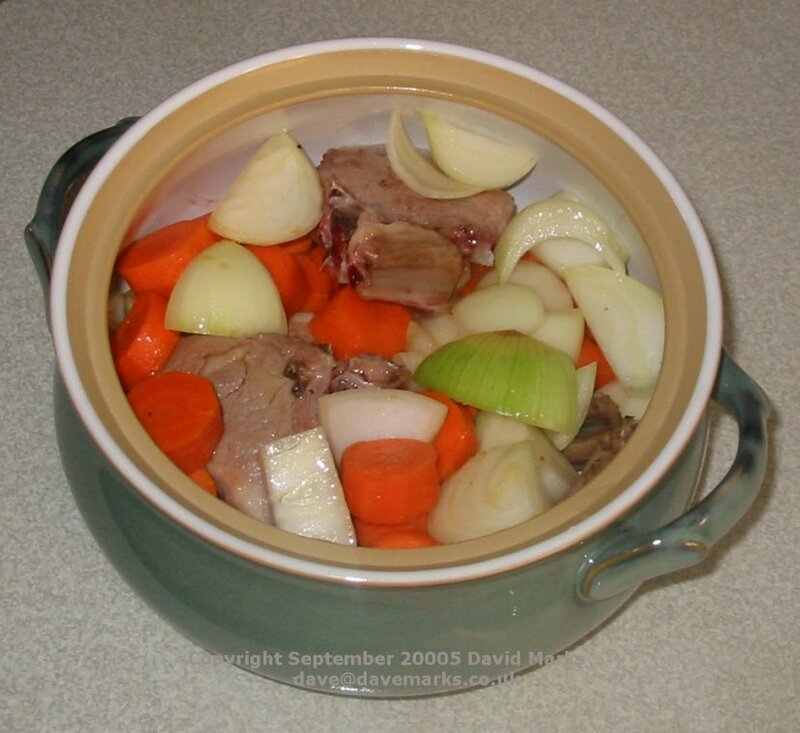 A traditional Irish stew is NOT thickened. It maybe very tasty but it's not traditional. Other than that, it is a good recipe. Use old leg bones to get the flavour into the stock without using stock cubes. Try browning them first to give some colour. Really easy Irish Stew recipe to follow. I added some mushrooms and a tiny bit of spinach, it worked a treat! It takes a while longer than the hour to cook , mine was nearly 2 hours for the potatoes to soften but to be fair I was not shy when i added all the ingredients. Will definitely be cooking that and any other recipes from this site. Question: Are you supposed to put a lid over the casserole? Answer: Yes, we have added to the instructions to say the casserole dish should be covered. Thanks for your question, it has helped us improve this recipe. Delicious. After several failed stew attempts in the past, I was pleased to say this Irish Stew recipe was a complete success. I used organic diced lamb and left on a low heat in a slow cooker overnight. The results were very full tummies after 2nd helpings all round. Thank you very much. Question: Can you use stewing lamb for the recipe? Answer: Yes, although I would increase the initial cooking time from 1 hour to about 3 hours and at a lower temperature (150C) to make the stewing lamb tender. 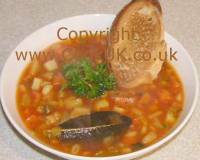 I made this stew for the 1st time today, we all loved it me my wife + 5 kids ate it all. easy recipe to follow, u have to try it. My mother used to cook Irish Stew but the gravy was made with cornflour and milk and therefore a white meal with carrots and peas providing the colour. I have never seen a white Irish Stew so I wonder if she was right? Comment: There's not really a "right" way, just what tastes best for you. The recipe on this page is traditional so your mother was making a variant of it. The cornflour would thicken the gravy so that's quite common but the addition of milk is unusual. Maybe she was trying to make the stew as nutritious as possible. 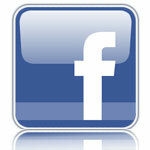 Great easy to follow. Had to cheat and use beef as my partner doesn't eat lamb but it worked perfectly. The wine was a good extra! Awesome recipe my family love it, I have made it several times now. Scottish gran used to make. We just loved it. This recipe was awesome!! Although had already roasted a leg of lamb the day before, I took the bone out, cut the fat off, then cooked the fat again rendering down my onions etc., then boiled the bone with meat on for sometime to finally get my lamb stock, which turned out perfect!! Thank you for this wonderful recipe! I have not yet made this recipe but find it attractive. Can it be prepared, cooked and left overnight, then reheated for a lunch party the following day? I should be glad of your advice. Answer: Yes, it can be left in the fridge overnight and then heated through the next day. Answer: Yes, the Lea and Perrins is there just to give some extra background taste. Either you can leave it out or add something like half a teaspoon of paprika which will slightly warm the Irish Stew. I know many might disagree but a teaspoon of balsamic vinegar (definitely not normal vinegar) will lift the flavour slightly. Wow! I've just made this Irish lamb Stew and it just tastes like me Nana Baxter's! 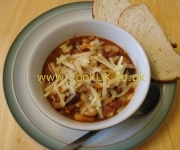 She would make a stew just like this for all us grandkids back in the 1980's! Waste of chops! Stew should be with neck, odds n ends. Cook for longer, and it makes it's own stock. I'd certainly have a bay leaf in, and probably other herbs but in moderation. Thanks for this recipe, your gravy was beautiful. I always have troubles with that part but not now. Thanks. Waste of chops???! Reading that comment was a waste of ten seconds that I cannot get back! Add your herbs and shut your mouth! This stew is excellent the way it is! Delicious. Though I'd add more potatoes and carrots next time. Just about perfect but have it with fresh crusty type bread, yummy. Waste of chops? Get back to Lidl you insect. This recipe is lovely. Lets see some of yours and let us comment on them. 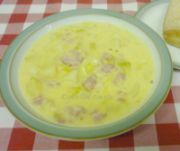 Love this recipe made this many of times now and it's a big hit with the family, nice on those winter nights with some fresh crusty bread. 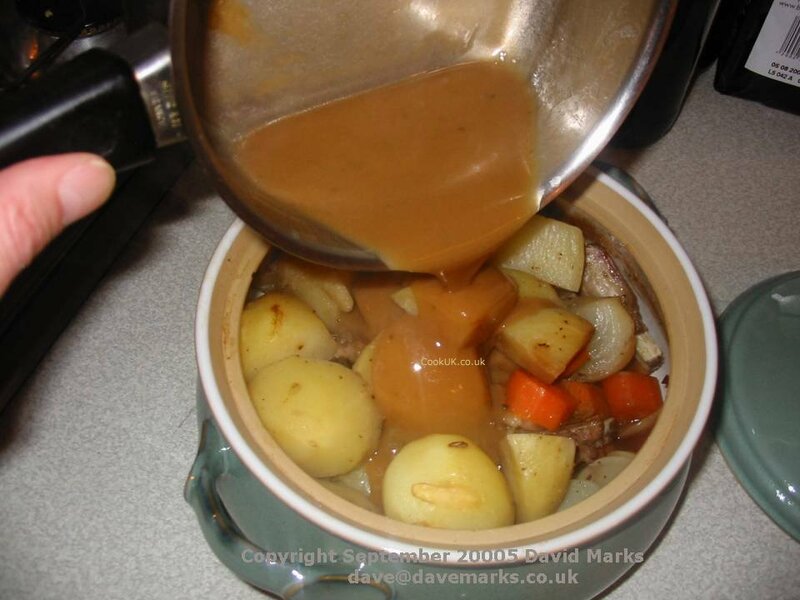 Superb recipe, Irish stew exactly how it should be, thanks very much for the recipe - well explained. And yes, crusty bread is the ideal partner for this.